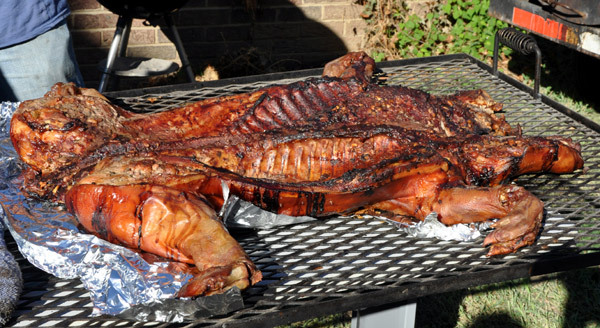 There is no way around it – roasting a pig just takes a long time. But, the process is fun and results were delicious, so it is well worth the effort. There are many long-winded (but useful) descriptions of the process online so I’ll try to keep this short. 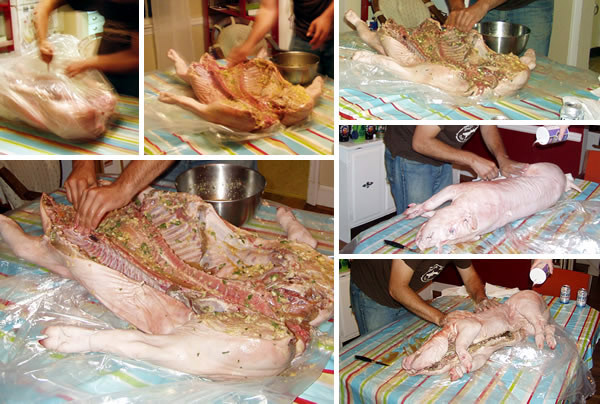 The process, established through several Google searches and tips from around the web, was to prep the pig, roast it, then eat it. The Pig: Buying was surprisingly simple. 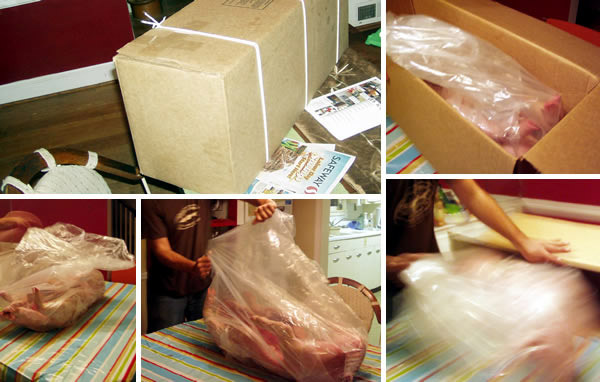 In DC I went through Union Meat Co. – which was most convenient and cheapest after calling around for several estimates (price per pound). Expecting about 50 people, I ordered 9 days ahead of time, about 1 lb/person. It ended up being about 55 lbs. You typically order within a range (e.g. 50-60 lbs), which also determines how long the roasting takes and how much charcoal to buy. Since we would have a flat grill (versus a spit roaster), I had the butcher make a butterfly cut so it would lay completely flat on the grill. The pig was thawed since I would roast it the next morning, but I did refrigerate it overnight. 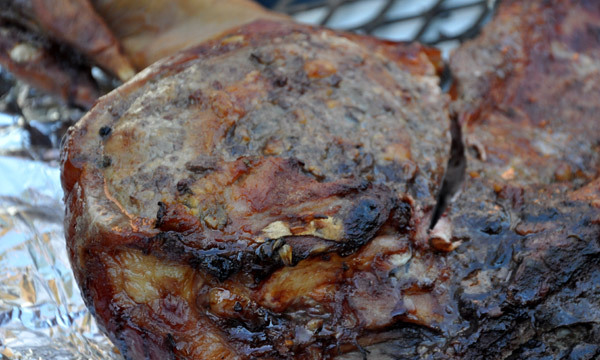 Marinade: The best sounding idea was a Cuban-style Mojo (read more here). It included mashing up about 80-90 cloves of garlic, 2 cups orange juice, 1 cup lime juice, 1 cup lemon juice, 4 teaspoons of salt, 30-40 whole peppercorns and a handful of fresh chopped oregano. Some honey was added to help thicken some of the marinade, so it would stick better to the ribs. The night before the roasting, I took this mix – which was more brine than marinade – and rubbed it all over the inside of the pig. In the thicker portions of meat I made small deep cuts and filled them with the mixture. On the skin, I rubbed in salt to coat the entire pig. In the end, I couldn’t distinctly distinguish the flavors in the meat, but the extra moisture was key for basting throughout the roast. Roasting: Estimates agreed to plan on 1 hour per 10 lbs, and 10 lbs of charcoal per hour. These worked perfectly. The pig was on the grill at 11:15 am, and off at 5:00. To start I used 25 lbs of charcoal, let it “ash over” and then used a shovel to spread the coals to the sides (allowing for indirect heat). About each hour I added another 8-10 lbs of hot coals to the roaster. It started hot, charring the skin a little, but settled into a even low heat. 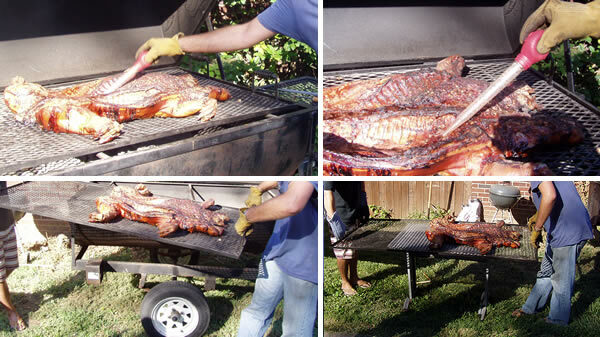 After several hours, many of the online write-ups suggested flipping the pig (usually at an internal temperature of 140° F). I didn’t see it as necessary, especially because 55 lbs is a relatively small pig. 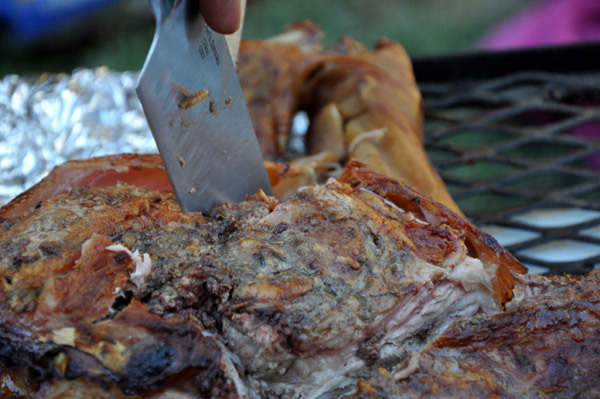 The pig was done when it neared 160° F in the thickest part of the meat. Before eating, we wrapped it in tinfoil and covered with a towel for 30 minutes. The setting helps maintain the moisture. Eating: Delicious! 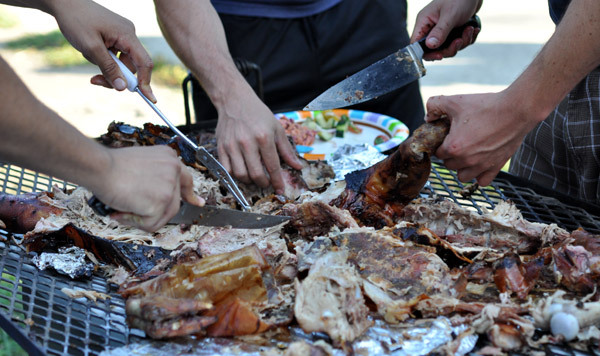 The meat was falling off the bone, and as three of us began carving I was amazed by how much meat was really there. It did feed the entire crowd of 50 after all. The well-charred skin was also very good eating. The non-charred was too tough. As it set out, people would come back and pick away at the remainig meat. Some of the less squeamish among us enjoyed other random bits, including the tongue, tail, and even brain. After the dust settled, there was almost no pig left to dispose of. The bones went largely to the dog, or were used for a pork stock the next day. About 24 hours from marinading to carving, it was a long process. Along the way it was a point of conversation, an aromatic party favor and ultimately the sort of dinner you wish you had more often. The large crowd necessary to consume the pig also lends well to a variety of sides and homemade sauces (mostly vinegar based, this time). 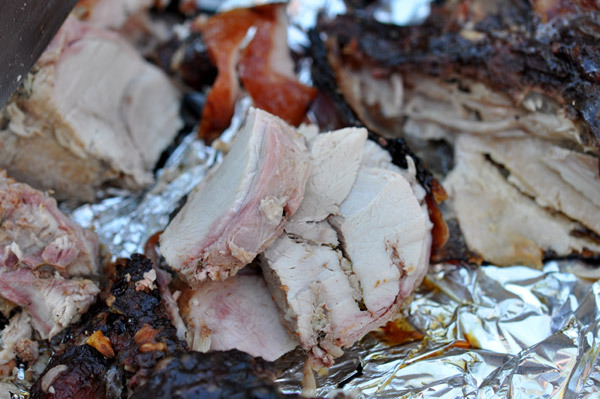 With the pig roast as a centerpiece, the whole event was simply a crowd pleaser. Ok, who ate the ears? @Johnna, thanks for the compliments on the photographs. 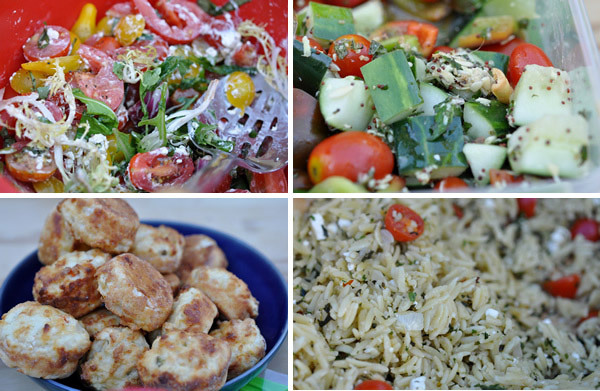 Half of the pics were taken by the author with a regular point and shoot digital camera and half (near the end) were taken with dSLR with macro lens… Some of photos were post processed in imaging software to make them look nice..
Nom nom nom! That looks very tasty, nice work bro. Scary yet very delicious looking!